Though innovative, our excellent Boarding Program is far from new. For nearly 100 years, we have offered girls the opportunity to live and learn here and prepared them for an exciting future. Being a part of our safe, supportive boarding program is one of the best ways to negotiate the transition to college with comparative ease. 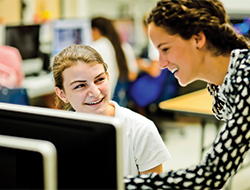 Garrison Forest provides several boarding programs and countless opportunities for girls in Grades 8-12 to become independent, forge lasting friendships, and gain immeasurable self-confidence to tackle life's many transitions. 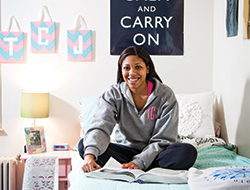 The traditional, 24/7 residential life option has long been the foundation of our boarding program. 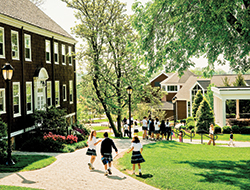 Students come from across the globe and around the country to live here September through June, with school closing for holiday and spring breaks. 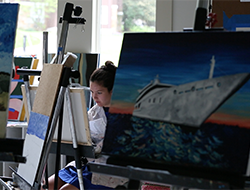 Upper School day students have a variety of options for significant short-term and long-term boarding opportunities. 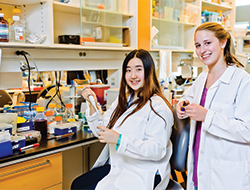 Students choose to live on campus while participating in the Women In Science and Engineering (WISE) program, athletics, student leadership activities and artistic endeavors. Beyond the cost of day student tuition, day student boarding may encompass a full year, one trimester, or a shorter time at a pro-rated cost. "At GFS, everyone knows everyone and is so friendly. My friends, boarders and day students, and teammates are like another family. Boarding at an all-girls' school has helped me to be more confident and try things I never would have before." What is Boarding at Garrison Forest all about? Spend the night at Garrison Forest and find out for your self. Call the Admission Office at 410-559-3111 to schedule your Garrison Getaway!